In India the cow is a revered animal but unfortunately most of the time I have seen “homeless” cows roaming city streets scavenging through piles of garbage looking for their next meal. It is quite a sad picture. I am always happy to see cows on fields eating grass… where they belong. In the past few days I have noticed cows on the fields and on the streets with their bodies painted in bright colors and bulls with their horns adorned with strings and painted in red and blue. 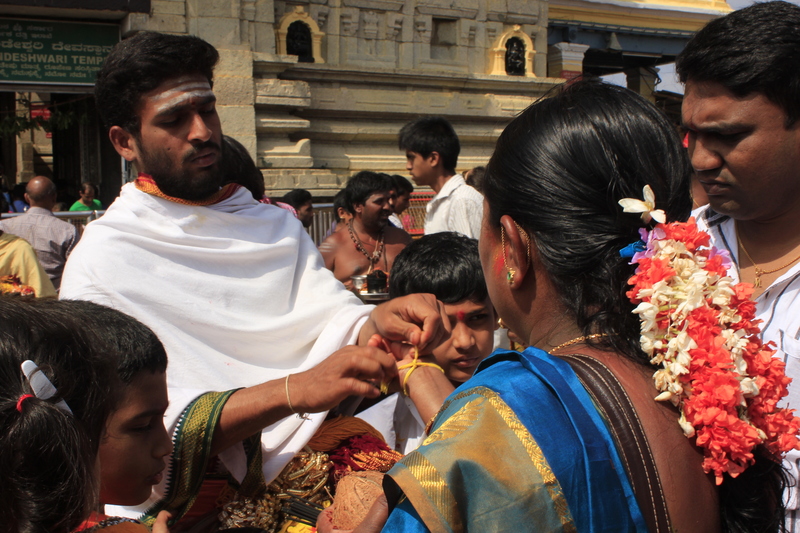 It turns out that this is part of a celebration in South India, the Mattu festival. 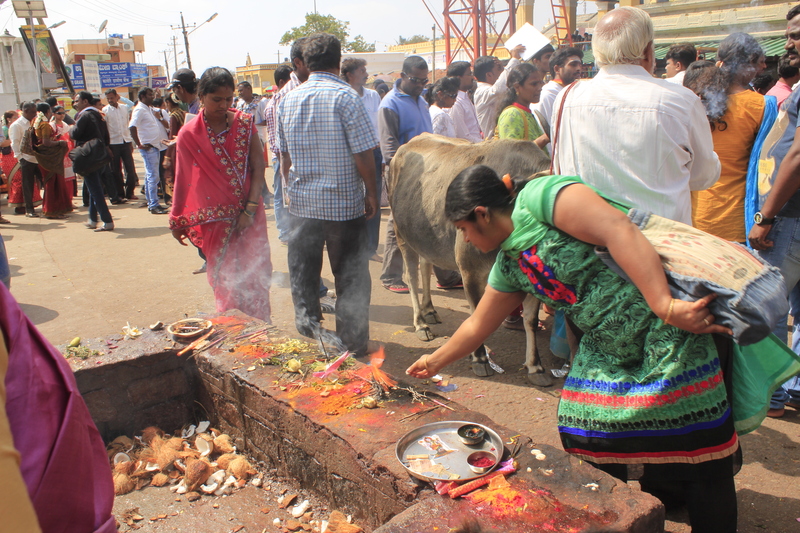 The third day of the festival is called Mattu Pongal. 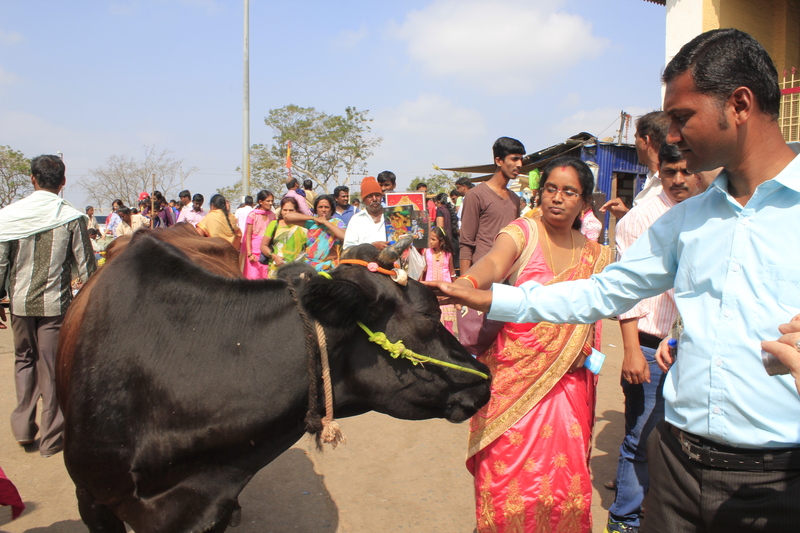 Mattu means “bull” in Tamil and on this day they celebrate all cattle and the important role that they play in helping farmers with their crops on the fields. At least they have their day of recognition! 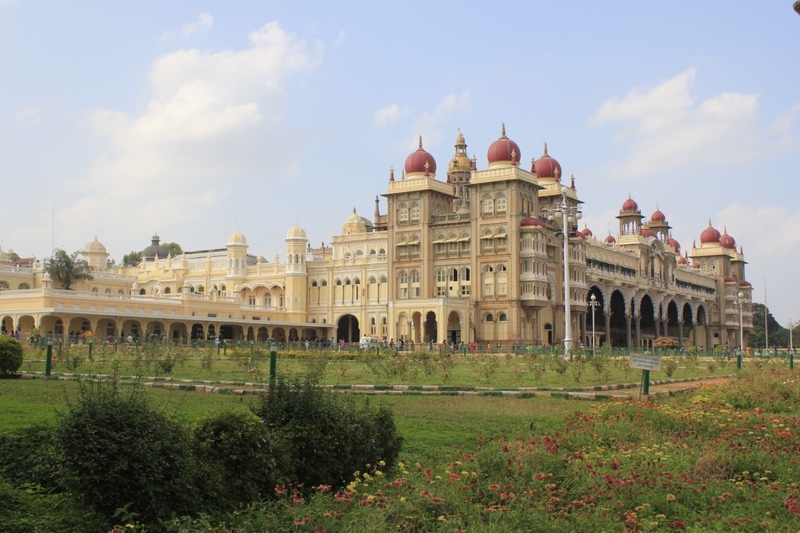 We visited the Chamundi Hill temple and the Mahisahsura statue, the Nandi (bull); which is Shiva’s vehicle, the Maharaja’s Palace Ambavilas Mahal, and St. Philomena’s Church in Mysore. 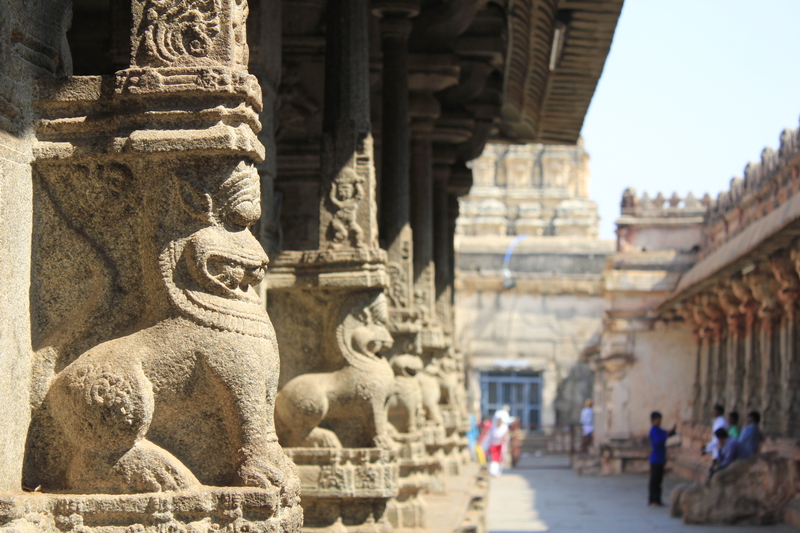 In the late afternoon we went to another town called Srirangapatna where we visited the Daira Daulat (summer palace), we saw some of the Fort’s ruins and ended the day in the Brindavan Gardens. typical hair-due for women, adorned with flowers. 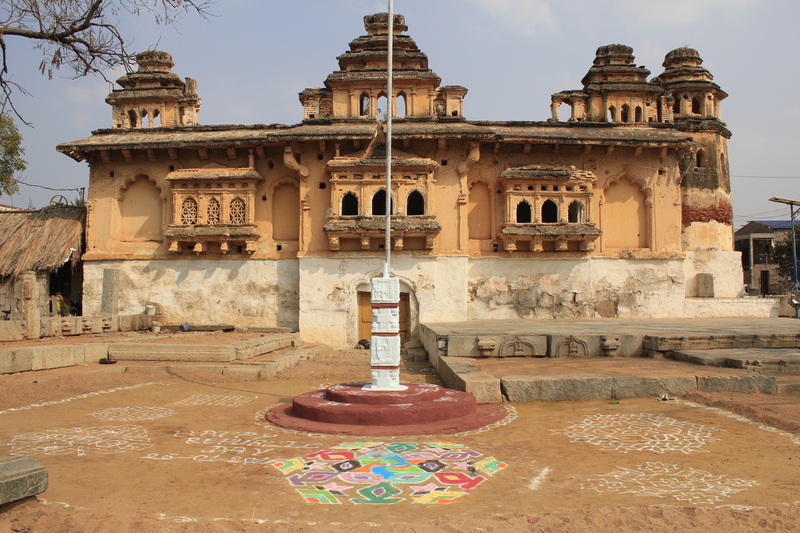 I took the train to Hospet, nearby town to get to Hampi. This was the best train experience with superb service; which I had never had before. I met a nice American Conrad from Colorado. 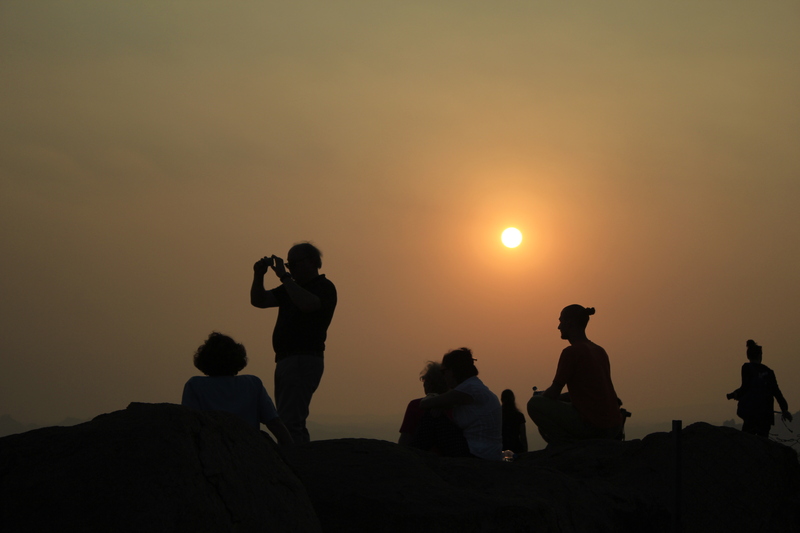 He is a great photographer who accompanied me to see the temples and ruins in Hampi. 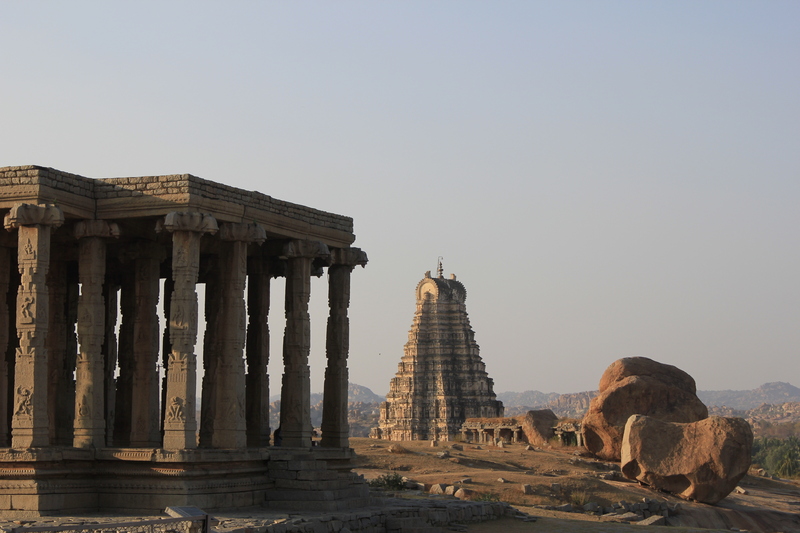 Hampi is a beautiful village, former capital of the Vijayanagara Empire. 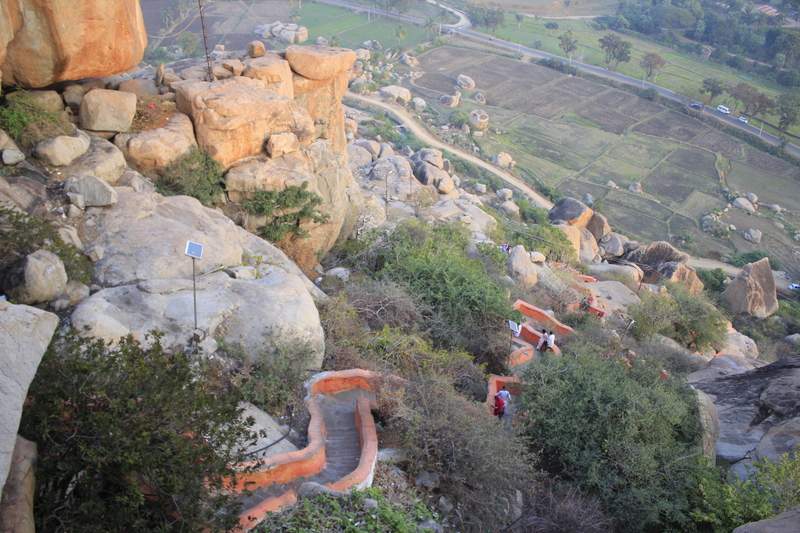 This is a Unesco world heritage site with well preserved ruins of buildings and temples carved out of gigantic boulders. During this round-the-world trip I have decided to try every type of accommodation (couch-surfing, hostels, home-stays, guesthouses) and I had yet to try camping. 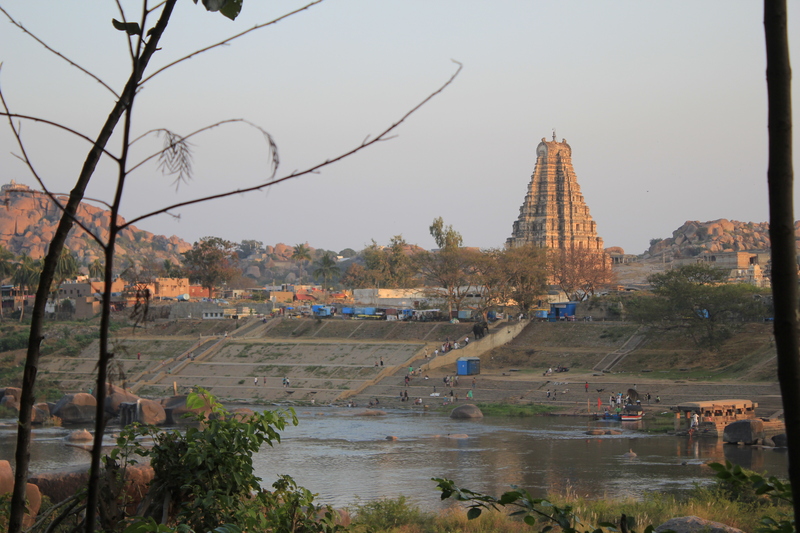 While in Hampi, I decided to stay in a tent across the river Tungabhadra. I enjoyed the fantastic views in the early morning of the sun rising over the ruins. On my last day I met Swetha, a very nice Indian girl from Hyderabad. 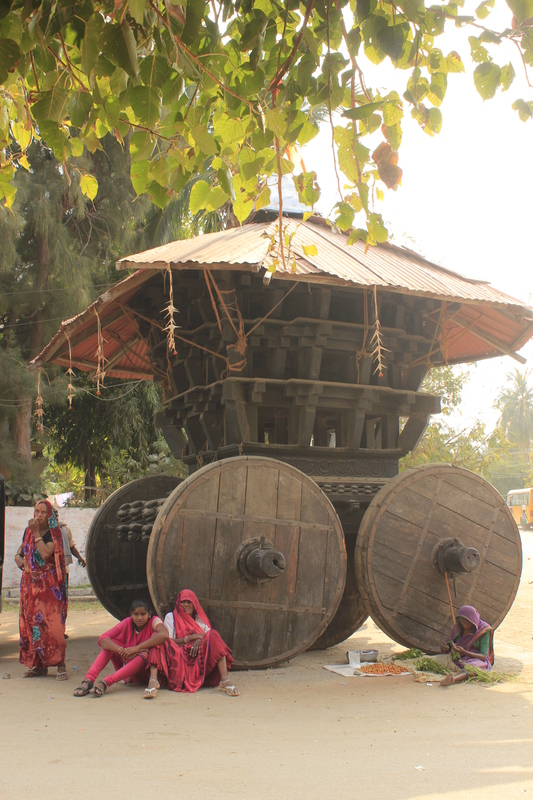 She was traveling on her own; definitely not your typical Indian girl. You usually don’t see single Indian girls out and about, especially traveling across the country on their own. I was so impressed by this girl. Her dream is to see experience new cultures and live in different countries. 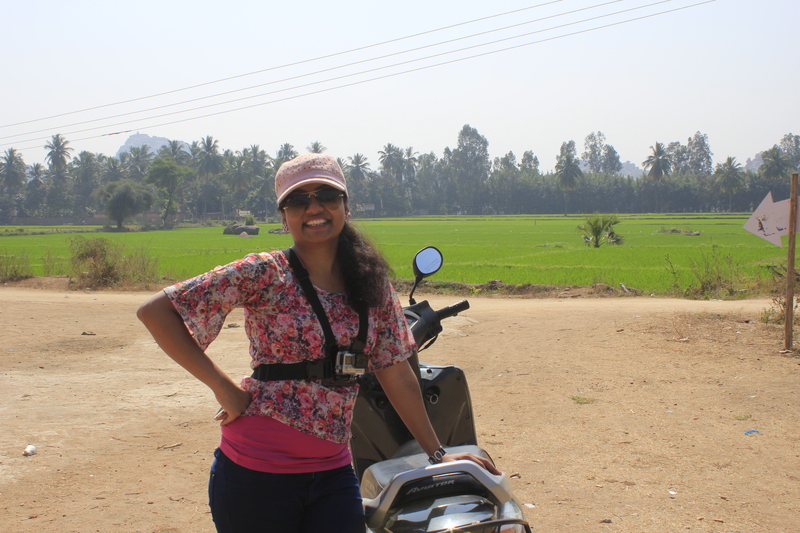 We hit it off right away and she took me to see the rice paddies and the dam near Hampi on her motorcycle. You always want to meet the locals and learn about the places you are in directly from them but as you can imagine this is not always easy. They just see you as yet another tourist. So it is always great when you actually find a local that takes an interest in you. We had a great day together! 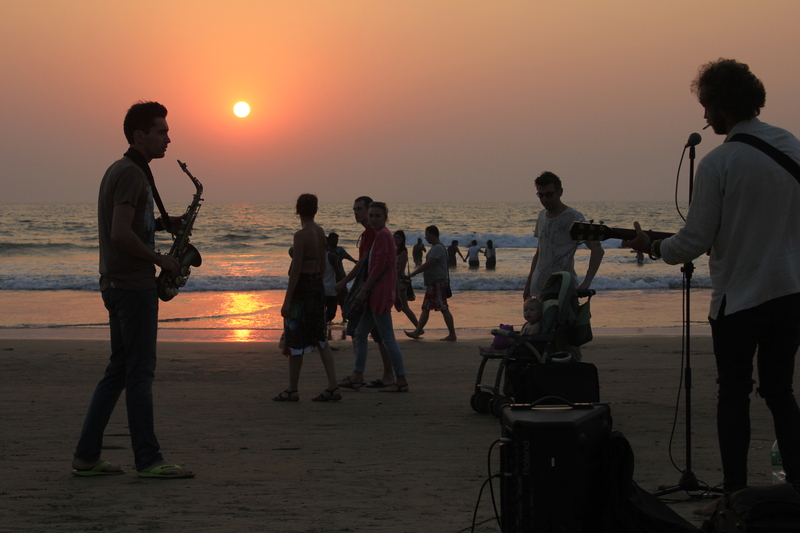 My next stop was GOA, a state further north on the coast known for its great beaches. This is where I had planned to meet my friend Ghani whom I had first met seven years ago in Mexico and had not seen since. I took my first sleeper bus ever in India; which is quite popular with budget travelers. It was a very bumpy twelve hour bus ride. We arrived to the village at around 4:00 am and all of the businesses and hotels reception offices were closed so we had to wait on the beach until sunrise to find a place to stay. Ghani had already pre-booked a hotel but unfortunately the agent that he used had changed his reservation the night before to a different town called Palolem, three hours south from where I was. I decided to take a break from traveling and spend a day seeing Arambol before taking a taxi to reach Palolem. 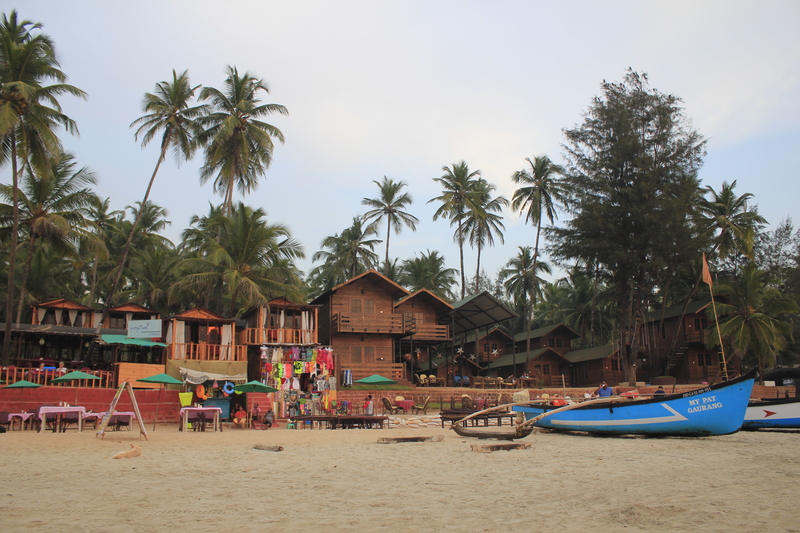 Arambol is known as the party beach in Goa, it is full of people, mostly tourists from Russia. The beach is very active with tons of people sun bathing, swimming, playing music, doing yoga, etc. At night it turns into a big party with a drum circle and a big souvenir market in the middle of the beach. 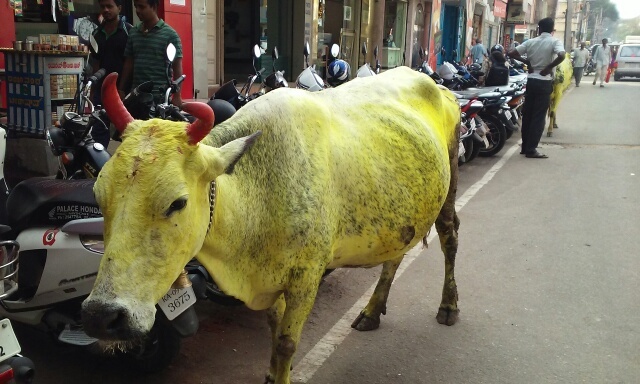 It is unfortunate that there are so many stray cows all around India. They are always rummaging through garbage bins and sometimes stealing food from people. It was great seeing Ghani and spending time together again. We had a few days of rest, peace, meditation and relaxation on the beach. Hopefully our paths will cross again in the future. After Goa, I took a flight to Madurai and then a taxi ride of three hours to go to Bodhi Zendo for some Zen meditation. See my previous post for more on this. My last stop in India after Bodhi Zendo was Tamil Nadu, starting with Pondicherry. I took another sleeper bus to Pondicherry; which was very bumpy and I barely slept. We arrived in the town at 4:00 am and it was completely dead but the rickshaw driver was nice enough to call the guesthouse and ask them to open their gate. I had to negotiate my stay from that very early hour until 7:30 am the following day. During the day I did a tour of the city, first beginning with the Sri Aurobindo ashram where we were able to visit the samadhi where the tomb of both Sri Aurobindo and the Mother, the founders of the ashram and Auroville (see previous post), the library and some of the common areas. I stayed a while here to meditate as it was a nice and quiet setting and I intend to keep my Zen practice alive after Bodhi Zendo. Pondicherry is a large French colony in India with some beautiful wide streets, colonial villas and fancy boutiques. You can find a lot of French expats living there. This is a stop for many people between Auroville and Chennai. I ended up meeting these super nice girls from Colombia Camila, Sofia and Paola and spent time with them seeing Auroville and the Matrimandir (see previous post). It is always great to meet people from Colombia; which is very rare while traveling, specially in India. It always brings me a lot of joy to meet people from my home country. After I left Auroville and headed back to Pondicherry in a rickshaw to take a bus to Mamallapurai, about two hours south of Chennai. This was to be my last stop in India before heading to Chennai to take a flight out to Vietnam. This town is quite touristy but very quaint and relaxing. It is filled with a ton of souvenir shops, seafood restaurants and ayurvedic massage places. I made it a point to have my favorite Indian meals one last time. I also tried an ayurvedic treatment called Shirodhara; which consists of a constant stream of warm medicated oil poured onto the forehead. This is highly effective to remove mental stress and anxiety. It is helpful in insomnia, migraine headaches, hypertension, and various neurological disorders. I feel nostalgic about leaving India. The South has given me so many wonderful experiences and so many opportunities for spiritual work. I am most thankful for the amazing, wise and highly spiritual people that I met during these two months. You have taught me a lot and I am thankful for every moment we spent together- James, Kelly, Jake, Manfred, Kate, Ghani, James, Andrea, Swetha, Conrad, Sofia, Camila, Paola, Petra, and a few others… much love to all of you!